How Do You Spell Finally? 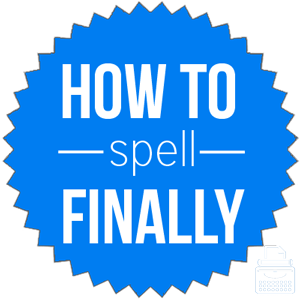 Home » Spelling Dictionary » How Do You Spell Finally? Spelling of Finally: Finally is spelled f-i-n-a-l-l-y. Definition of Finally: Finally is an adverb meaning after a long time, and it usually involves some sort of delay or difficulty. Additionally, it is often used to introduce the last premise or point in an argument. Pronunciation of Finally: Finally is pronounced fine-a-lee. What does finally mean? The adverb finally is used to describe the completion of an action after a length of time or an initial delay. It is also commonly used as a way of introducing final remarks, points, reasons, and arguments in essays and speeches. When used in this way, it is considered a “transition word.” It may also refer to the last of something or someone in a series of events or objects that are related. When they had finally arrived, it was already too late. Finally, Joan, can you explain why you think you are the best candidate for this job? Finally, lowering taxes will help small businesses create jobs and grow the economy. The adverb is formed by adding “-ly” to the root word “final,” which can act as a noun or an adjective depending on how it is used in a sentence. There are no phrases that use the word finally, however, it is often used by itself to express excitement, frustration, or exasperation when a person has waited for something or someone for a long time. For instance, if your friend arrived at your house an hour later than agreed, you might exclaim, “Finally!” when she shows up. Take caution when selecting one of the following words as a synonym for the word finally as nuance and context are very important when determining the right word to use. The word finally is an adverb that is formed by adding “-ly” to the word “final.” It refers to the time when an action has been completed, often after some delay. It can also refer to the last point, reason, argument, or detail in an essay, event, or presentation.